In Ep. 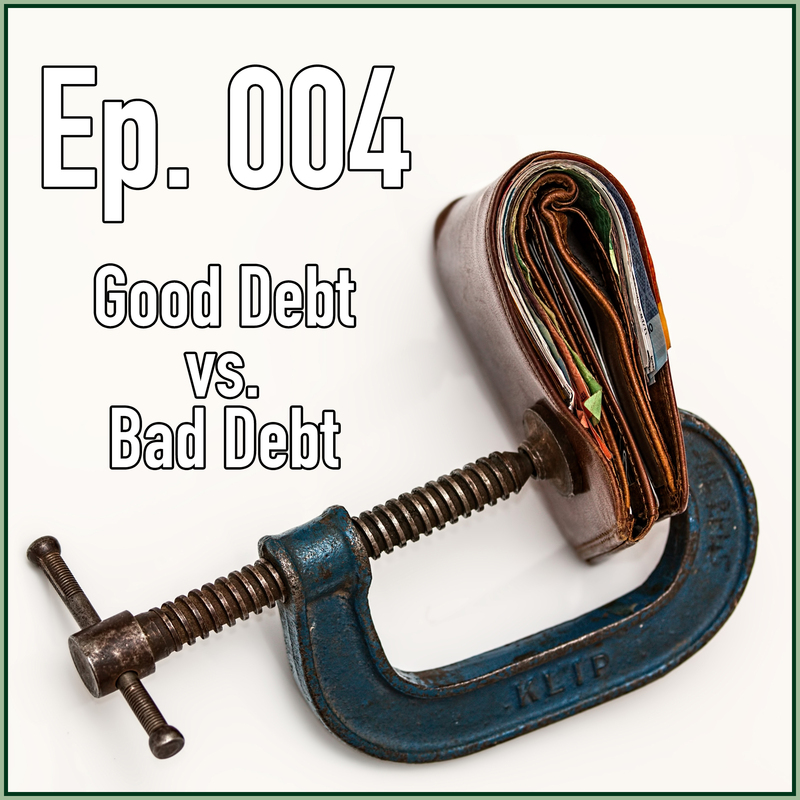 004, Tim and Tom break down the differences between “good debt” and “bad debt”. However, it’s not always so black and white. They break down the most universal types of debt: mortgages, car loans, student loans, credit card debt, small business loans, home equity loans, and more! Each type of debt can be considered good or bad depending on the individual, so be sure to listen to this episode to decide whether or not these types of debt are good or bad for you! Tim Mullooly: Welcome back to Living With Money. Today, Tom and I are going to talk about good debt versus bad debt. Tom Mullooly: All debt is bad. Tim Mullooly: The term good debt versus bad debt it’s never that black and white or absolute. We kind of look at it as a sliding scale of okay debt versus not so okay debt, but that’s not as catchy a title as good debt versus bad debt. Tom Mullooly: True. I think it would probably be best if we just run through and kind of walk through the different types of debt, some of the universal terms that people throw around in the business, talk about … Maybe we should just talk about a few pros and cons of … What do you think about that? Tim Mullooly: I think that’s a great idea. People think about debt or generally good debt. One thing you always hear is mortgages. Generally speaking people think mortgages are good debt. I would tend to agree with that, but every individual person is different, so we’re just going to kind of break it down and you can be the one to determine if it would be good or bad for you. Tom Mullooly: Interest rates on mortgages are usually low when you’re comparing them to other forms of debt like a car loan or a credit card, but it’s low on a relative basis. My brother bought his first house, the mortgage, the interest rate on his first mortgage in 1980 was 17%. Tom Mullooly: Yeah, relatively speaking it was a low rate, but I mean now it’s eye-popping to see a number like that. We do get a lot of questions from clients who are thinking about refinancing, and I think sometimes we get hung up on splitting hairs. The typical question now in 2018 will be, “I’m thinking about refinancing. This mortgage is offering me four and an eighth, this one is four and a quarter, but it’s a couple of points.” I just tell them to just stop and back up. Anything historically under 5% you’re doing great. Tim Mullooly: One pro for a mortgage is that it offers you some sort of stability and it allows you to build up equity in the property over time. Everyone needs a place to live. Most people out there can’t conjure up $200,000, $300,000, whatever it might be in cash, to buy a home. It might not be good or bad debt, but it is in a sense necessary debt for a lot of people to be able to have a place to live. Tom Mullooly: It’s also a good form of leverage because if you were to put down say $30,000 on a $150,000 condo, you make your mortgage payments for a few years and then your $150,000 condo is now worth say 180. You go to sell it, you’re going to realize $30,000 more in your pocket and you started with a $30,000 down payment. So that is a good use of debt, a good use of leverage, quite the opposite of what, Tim, I just covered in that video that we put together as well. Tim Mullooly: Right. Yeah, I’ll link to that in the show notes. You should definitely check it out. But like Tom was saying, land over time is generally an appreciating asset as opposed to some different types of assets that we’re going to talk about coming up. But you need to maintain the property over time and keep up with staying current how houses and condos and apartments are supposed to look, and hopefully when you go to sell it, it will be worth more than when you bought it. Tom Mullooly: The entire process of getting a mortgage and having mortgage debt really is a lot more complicated than most other debts that we’re going to talk about it. In most states here in the country you need to get lawyers involved. There’s going to be the cost of moving. You’re going to have closing costs. You’re going to have some big expenses you’re going to have to lay out when you move into the house. So there’s a lot of things that you have to take into consideration when you’re going to take on mortgage debt. It’s not necessarily just the principle and interest every month. One other thing that I think we ought to mention Tim before we leave this is that a mortgage loan unlike other loans is amortized over time. Maybe we can put a chart in the show notes to show what amortization means. Over your 15, 20, 30 year mortgage, you start out by paying mostly interest very, very little part of your payment becomes principle, and that changes over time, so when you get to the end of your amortization schedule, your mortgage life, you’re paying mostly principal, very little interest. I also think that one of the biggest problems that we’ve seen in the last 10 years is that too many individuals will listen to their mortgage broker and go to buy the biggest house that they can afford per their payment. That’s a mistake. So if you ever hear the term, “Well you’ll grow into the payments,” be very afraid, just be very nervous because if you’re not in a position, some kind of job or business where you see your income growing significantly only bite off what you can afford. Tim Mullooly: That’s a lot of good information about mortgages. We’re going to move on to the next type of debt, student loans. Generally seen as a good type of debt, but that’s going to vary for everyone depending on their views of the necessity of higher education. Some people don’t think that it’s a good investment to take on all these loans if you don’t really need to. Some people think that it’s kind of getting your ticket into the game depending on what industry or what career choice. So it kind of depends on what you plan to do for a living if the loans are going to make sense for you. Tom Mullooly: I think one of the more difficult conversations and decisions that you need to make as a young person, “What am I going to study in college? What do I want to do with my career after college,” because that should answer some of the questions that you’re talking about. If you’re going to school because all your friends are going to school, you may need to step back and think about this, because if you’re going to get a job that may pay $25,000 to $30,000, taking out $100,000 or more of student debt doesn’t make economic sense. It’s a tough pill to swallow. But there are some careers that you don’t need to go to college for. Tim Mullooly: And kind of along the lines what you are saying, if you’re just going to college because your friends are going to college, might not be a smart idea to take out the loans just so you can go have a good time for a couple of years. I see it as making a bet on yourself. What that means to me is you’re taking out these loans to finance your education to hopefully make you more money down the road. You should take full advantage of those years that you have in college. If you take out all these loans, sleep through classes and don’t give it your best effort and don’t position yourself to get a good job coming out of school, it’s going to be a waste of money and a waste of your time. So if you take out these student loans, just keep that in mind that you’re going to be the one paying back these loans, so you want to put yourself in the best position to make the most money, have the best job and best career possible when you get out of school. Tom Mullooly: It’s a shame that we’re young when we start college. I mean when I was a college freshmen I was 17 and I had no idea what I wanted to do at the time. One of the things that really impressed me when I went to college were some of my classmates had just gotten out of the military, some of the people that were in my classes were older, I say older, they were probably 30, but they were going back to school to get a second degree, or to finish the degree that they had to interrupt because they were having a family or because of work. Those people were extremely focused and they were the best students and they sat in the front, they raised their hand, they asked lots of questions. They really got a lot out of their investment. And it’s a shame because there’s still a lot of people that look at going to college as 13th grade or three or four years of partying. Tim Mullooly: It’s an expensive party to go to. Tom Mullooly: It’s a very expensive party, you’re going to be paying a long time for. I mean these student loans are normally set up on 10 year repayment schedules. This is a serious investment. Sorry to end on such a somber note about student loans, but I think there’s a lot of people out there who are not understanding the seriousness of this money being lent to them. You’re not borrowing against the house or even a car that can be repossessed. It’s like Tim said, it’s a bet on yourself. Tim Mullooly: The next type of debt that we want talk about here are car loans, financing a new or used car. Similar to a house most people can’t really come up with the cash to just outright buy a new car or even a used car. Most people, depending on where you live, need some sort of car to get you to and from places. So again, it’s kind of seen as a necessary debt for a lot of people. Tom Mullooly: In 2016 the average price, average price of a new car, $36,000. That’s a lot of money. Tim Mullooly: It is. And you need to understand the value of the car that you’re buying and the value of the loan because cars depreciate and they depreciate fast. As soon as you drive the car off the lot it’s worth significantly less than what you just paid for it. So you don’t want to structure a financing deal for the car where at the end of the deal the car is essentially worthless. Tom Mullooly: I’ll give you another little fact that I’ve learned over the last few weeks. The average length of time that people drive a car now is just a shade over three years, it’s 38 months. So if you’re signing up to buy a car and you’re going to pay for it over four years, that’s 48 months. You’re going to get tired of driving this car and you’re still going to owe money on it, and you’re going to have something called negative equity, which we’ve written about. This is really important. People are now taking out loans to buy cars that are 60 months, that’s five years, 72 months, 84 months. For goodness’ sake on BMW, on their website, you can finance a car for 120 months. That’s 10 years. Tim Mullooly: I don’t know many people who’ve been driving the same car for 10 years. Tom Mullooly: Warren Buffet has. He’s been driving the same car I think for like 30 years. I think what we need to do is kind of go back to the old fuddy-duddy ways and say, “Hey, do you really need to lease a BMW?” I’m not picking on them. “Do you need to a have a car leased where you’re paying $400 a month, or a car loan where you’re paying $400 or $500 a month?” That’s a lot of money. That’s $5,000 or $6,000 a year out of your pocket. Tim Mullooly: I mean, this goes for every type of loan out there, but especially with cars, the payments that they give you on the little books that we’re talking about, they’re minimum payments, they’re not maximum payments. What that means is if you have more money available to you and you can afford to send more money in each month, you can pay down that loan faster than it says in the deal. You can send more money in each month than just the minimum payment and you can pay it off faster. Tom Mullooly: This is a really good tip and this is how we teach clients to get out of debt, because what we do is we point out to them that the interest that they’re paying on a loan may be more than what they could receive investing in the stock market. So by paying down a high interest debt, they’re actually creating that yield for themselves. Tim, I kind of want to skip ahead a little bit. Let’s talk about credit card debt because I think this is a nice segue. Credit card debt is probably the highest interest rate debt that you can find. Why? Because it’s an unsecured debt. It’s not secured by a home like a mortgage, there’s not a loan on a car that a car can be repossessed. You’re going to Macy’s and just buying stuff. It’s an unsecured loan. So MasterCard, Visa, whoever, is basically taking a bet out on you saying, “Okay, we think you can handle based on your history and your income, we think you can handle a credit limit of $5,000. Don’t exceed it. You’re going to have some penalties if you do. And if you don’t make the payments or don’t keep up with the payments, we’re going to start cutting off your credit,” it’s generally seen as probably the worst type of debt around. Tim Mullooly: Yeah, I would have to agree. Generally speaking the worst type of debt that you can have, not only because you can control how much credit card debt you have. Also, these extremely high interest rates are killers. My general rule for responsibly using a credit card was if you can’t pay off the balance at the end of each month or shortly thereafter, don’t buy it. Tim Mullooly: You want to establish good credit throughout your life, and one good way to do that is to get a credit card. Some people are terrified of credit cards, but they can be a very good thing to have. You need to establish credit, but you need to do so responsibly. One way to do that is to buy things on your credit card that you can afford to pay off at the end of each month, and then pay off that balance. You don’t want to have a balance running at the end of each month and walking around with a balance building up on your credit card because that’s when the interest kicks in and that’s when you start really paying for it. Tom Mullooly: You buy something on a credit card and you pay for it over time. That interest is compounding at a rate that’s ultimately that you have to pay. So you may spend $1,000 on an item, pay for it on a credit card. If you stretch those payments over time you may wind up paying $1,300 for an item that actually cost you $1,000 and it wound up being a piece of junk. But with the interest compounded on top of it, it really does snowball into problems. We do counseling for clients to help get them out of debt by just showing them, yeah, there may be some interest, some credit card that pays, or it has, it carries a very low rate of interest compared to what they have. I mean, we’ve seen some that have interest rates of 30%, some that are 12. I’m sure that someone’s going to be able to point out a credit card that’s got an even lower rate, but the fact of the matter is can you earn that somewhere else? If you’re not making 12% in the stock market, you’re probably better off paying down this debt. We would encourage you to get out of debt before you start taking on investments like that anyway. Credit card, we can’t say it enough, it really is the worst type of debt. Tim Mullooly: It’s really bad and it can get scary for a lot of people. But like I said, establishing credit is necessary because to do some of the things that we’ve already talked about in this episode, like get a mortgage or you qualify for a car loan, you need to have some sort of credit. Tom Mullooly: Now there’s another kind of debt out there where you’re taking a bet on yourself. Tim Mullooly: Right, you’re talking about small business loans. For the business owner taking out a loan can either be really good or really bad. Similar to the student loans taking a bet on yourself, if you have a really good business plan in place and you’re extremely hardworking and you believe in what you’re doing and you know for a fact that this business is going to be great and successful and profitable and make you money, and you’re going to be able to make back the money that you take out on the loan, then that’s great debt to take on. In the same vein, if you are lazy, kind of halfheartedly starting this business like, “Oh, I guess I’ll start my own company or something, I don’t know what else to do,” you don’t really have a vision, you don’t really see it making too much money, not sure if you’re going to be able to pay back the loan, then it becomes bad debt. Tom Mullooly: That’s very important. If you have a solid written business plan you can apply for loans through the Small Business Administration. There is money out there for you to start a business, but you have to have a well-thought-out and well-detailed written business plan and go present it and you’d be surprised at how much money is out there and available to you. Tom Mullooly: Unfortunately a lot of people are so busy getting their business off the ground that they’ll borrow against credit cards, or they will take a loan against their house, which kind of leads into the next type of debt, which is home equity. Tim Mullooly: Having 30 years’ experience in the business I’m going to defer to Tom on this one because he knows much more about this topic than I do, home equity loans and lines of credit. Tom Mullooly: The first thing I’ll say is that there haven’t been too many people who have had the ability to get a home equity loan in the last 10 years because so many homes have been underwater. You can get a loan if you have positive equity in your house, meaning the house is worth 500,000, I have a loan, a mortgage of 200,000. That means I have $300,000 of equity in my house. If you can get the loan, and now they’re becoming available again, you can usually borrow 70% to 80% of that in the term of some kind of either loan or a line of credit. Now loans and lines of credit have a distinct difference. A loan actually says, “Here’s your loan, here’s the money, and here’s your repayment schedule,” and you’re going to start, you can draw it down or you can start repaying it right away. Tim Mullooly: So it’s like a lump sum. Tom Mullooly: Correct. A line works a little like a credit card in the sense that suppose you have $100,000 line of credit. You can use it, pay it all back, use it again. A lot of these lines and loans against home equity will typically have what they call a drawdown period and a payback period. Your drawdown period may be typically 10 years, sometimes it’s 15 years, where you can draw the line down or draw the loan down, pay it back, use it again, pay it back, use it again. Once you reach the end of the drawdown phase, then you’re in the payback phase. While you’re drawing down on a line of credit, your payment will only be the minimum interest that’s owed. Once you cross the line into the payback period, now you have a more traditional loan payment where they say, “Okay, now we got to close this thing in the next 15 years,” or the next 10 years, or even the next 20 years, whatever the terms are. Most times it’s also going to be on some kind of variable rate, but it’s a way to tap into money that you may not get otherwise. Now years ago home equity interest is now … Used to be deductible. Now that is going away under the new tax law. There were people who were actually saying, “I’m not even going to bother with student loans. I’m going to pay for my kids college education through home equity loan and I’m going to write off the interest.” Not really supposed to do that by the way. Tim Mullooly: Kind of clever idea. Tom Mullooly: It was out there. Yeah. It’s important to know these loans and lines are now becoming available again, people are getting a little more equity back in their homes, and so banks are on better footing and so we’re starting to see this come back and it’s certainly another form of debt that you need to consider. Tim Mullooly: One last type of debt that we want talk about, margin accounts. Once again, I’m going to defer to Tom on this one. Tom, do you want to explain to our listeners out there what a margin account is in terms of investing? Tom Mullooly: The way a margin account works, once you sign up for a margin account, assets in your account become … I’m going to use a bad term, borrow-able. So you can borrow against the assets in your account. Suppose you have an investment account with a broker that’s worth $100,000. You can take a margin loan against it for … You can withdraw $50,000 in cash, half of the amount in cash, or you can buy instead up to another $100,000 in securities. So you can actually have $100,000 in equity at a brokerage firm and you’re swinging around $200,000 worth of stock. You will pay interest on it and the interest rates are not cheap. They’re not credit card rates, but you’re going to see high single digits, it’s definitely more than a mortgage and a home equity loan, not credit card rates. But that interest does compound every month. So you have to be aware that the clock is ticking when you’re borrowing money. If the value of your securities in your account go down past a certain threshold, you will have a margin call. They’re serious. So when you get a margin call, you usually have 24 or 48 hours where you have to resolve the debt. How do you resolve a margin call? Understand that it’s not a liquidation. It’s a call for more money in the account. There’s a couple of ways you can resolve a margin call. Bring more money into the account. That will help resolve the margin call, make it go away. You’ll still have crappy numbers in your account because your stocks are going down. You could sell securities to relieve the margin call. This is something that I’ve seen this over 30 years were people get mixed up with margin, they don’t really understand this, but when you get a margin call, you’re typically, you’ve gone from 50% equity in the account down to the mid-30s. You may be at 35% or 33% equity in the account. A lot of people are reluctant to sell because they don’t want to actually realize a loss in their account. So they hang on and they wish that their investments would go up. It doesn’t always work that way. In fact, it almost never works that way. So the problem is you start flirting with a margin call. If you want to … If you can’t bring in money, new money to satisfy the margin call and you have to sell stocks, I feel bad for you brother, I really do, because it’s a wipe out. Remember, when you started with $100,000 in your account and you bought $200,000 worth of stock, you owe the broker $100,000. They are not going to let that go, no matter what. The value of your stocks are going to go up and down, you still owe the brokerage firm $100,000 and they’re going to get paid. You have to be right on margin when these things go up. One of the biggest areas of complaints that brokers get are options and margin. I will venture to say you have to sign off on an option account, you really, you’re given plenty of warning about options and the risks in options. I think the real problem comes with margin and people who don’t know what they’re doing. Tim Mullooly: Seriously scary. People can lose a lot of money. Tom Mullooly: As we talk about online brokers, this may be a good opportunity to just kind of preview something that we want talk about in an upcoming podcast. Tim Mullooly: If you have a question that you’d like us to answer on Living With Money, get in touch with us. You can e-mail us at livingwithmoneypod@gmail.com. You can find us on Facebook and send us a message there. You can tweet at us on Twitter, shoot us a message on Instagram. We’d be happy to answer any of your questions. We got a question from one of our listeners. He asked what our thoughts were on investing apps, specifically Acorn and Stash. We’re going to briefly answer the question. Tom Mullooly: This is such a good topic. We’re going to cover this on a standalone podcast. Tim Mullooly: There’s a lot to talk about here, so this is kind of just a little intro into that, but the next educational episode here is going to completely cover investing apps and go the ins and outs of all the different types of them as well. Tom Mullooly: I think Tim, before you get into the specifics, I think it’s important to say that we consider investing to be a long game. Tim Mullooly: One of the first things I’ll say about investing apps, the access to the app is great. You can look at it as many times as you want, but you probably shouldn’t. I like to view investing apps kind of like going on a diet. If you check your progress multiple times a day, if you step on the scale and see how much you weigh multiple times a day, every time you eat, every time something happens, you’re going to drive yourself crazy. The same thing is going to go for investment apps. What I recommend is finding a period of time to check your apps, whether it be once a month, once a quarter, every couple weeks. Don’t check it daily. You’ll drive yourself crazy. In the same vein, the best way to learn is by doing. I don’t think that using these investment apps is a bad idea, but do so responsibly. Just keep in mind those E*TRADE commercials of using your investment apps to buy a huge boat, not exactly real life. I would take these investment apps as kind of a learning experience to get your feet wet into the world of owning stocks and bonds and having some sort of investment. Tom Mullooly: When is a dollar a month really expensive? Tim Mullooly: That kind of segues nicely into what I was going to say about Acorn and Stash. Both of these apps, they advertise it is only a dollar a month to have your account. If it’s over $5,000 you pay 0.25% a year. Tom Mullooly: But Tim, it’s a dollar. Tom Mullooly: It’s $12 a year. It’s nothing. I spend that on a couple cups of coffee. It’s nothing. Tim Mullooly: You’re right, but the average account size on Acorn right now is just under $200. Some quick math. Tom Mullooly: So the average account at Acorn is what? Tim Mullooly: Just under $200. You’re paying a dollar a month, which comes out to $12 a year, $12 out of your $200 account. Tom Mullooly: That’s like 8%. Tim Mullooly: Yeah, it’s expensive, and people don’t realize that. So it depends on the amount of money you have in the account to see if it’s actually worth it. The whole thing with Acorn, and it’s a cool concept, I have to give it to them, is you connect to debit card. When you make a purchase, it rounds up to the nearest dollar and takes that difference of change and deposits it directly into your investment account, and over time invests in fractional shares of different ETF portfolios, and it depends on your risk tolerance that you can choose whether you want to be conservative, aggressive, or moderate. In the full episode on this I’ll dive into my problem with being able to set and change your own risk tolerances. That’s a different discussion. Just keep in mind that these things, Acorn and Stash and other investment apps are good as a learning experience, kind of expensive depending on how big your account is, but again, it’s an interesting way to get started in investing. That’s where I’m going to cut it off for this episode. But check back to the next educational one and we’re going to go full in on all these apps. Tom Mullooly: Yeah, we’re going to talk about all of these apps. I think this will be a really good episode because we’re going to cover of a lot of names that people recognize and maybe some that people don’t, but I think this has been a good educational piece on the different types of debt that’s out there. Some debt for your neighbor may be good debt, may be bad debt for you, but it’s worth it to keep things in perspective and understand it’s not black and white for everybody. Tim Mullooly: Use these types of debt on a sliding scale like we talked about in the beginning and judge whether it’s right or not for you. If you’re listening to this on iTunes, please subscribe to the podcast to get new episodes every week, and feel free to leave us a review or a comment because it would really mean a lot to us. Be sure to follow us on Twitter and Instagram at @LWM_Podcast for more news and updates about the show. Hopefully you found some good information in this episode. That’s going to do it for this episode of Living With Money. Thanks for listening and we will see you on the next one.